Those were the three words from my wife that greeted me as soon as I was within wifi range. My cellphone ‘pinged’ with incoming messages, as our boat skipped across a dead calm South China Sea on Friday last week. ‘Not another earthquake?’ was my first thought. I got this message as I was returning from a most relaxing and exhilarating day of diving at the Tenggol Marine Reserve, which lies around 20 kilometres off the Malaysian State of Terengganu. I didn’t have a care in the world. Two hours of diving at 15m surrounded by breathtakingly beautiful underwater ‘gardens’ of hard and soft corals, sea fans, extravagantly coloured fish, turtles and even the occasional shark, had left me feeling very content. The world seemed a place full of peace, beauty and light. ‘Gunman on the rampage, over 40 dead’, the second message read. My heart sank. My stomach flipped. I felt sick. As soon as I got to the hotel and checked the news feeds I was confused. Forty dead in a mosque in Christchurch? My first thought was it must be a domestic dispute gone badly wrong. Or maybe Muslim on Muslim killing. But in New Zealand? It was incomprehensible - safest place in the world statistically - a mosque under attack? I stared at the reports coming in. Not Muslim on Muslim. But surely, not a New Zealander killing our own people? Do we have one among us that could do that? For thirty years I have been telling thousands upon thousands of people at our seminars around the world, that even if you don’t like New Zealand, you’ll love New Zealanders. I make potential migrants to our shores only one promise, ‘You’ll love us, we are the most friendly, chilled, welcoming and tolerant people in the world. And the country is ludicrously safe’. Could I have got it all so wrong for so long? The death toll kept rising through the afternoon and early evening. I have written, rewritten and written once again this blog piece over the past few days as more information comes to light and I come to terms both with my own feelings and the facts on the ground. Initially, I felt disbelief. Followed by horror. Replaced by unadulterated shock. Then physical sickness. I sat, alone in my hotel room and I shed a few tears. Then guilt. I had been telling Muslims for years that they along with anyone else that worships any God, would always be welcome in our country. We are the ultimate "live and let live" society. Everyone is safe, or should be. There are only around 25 to 30 murders a year (around 8 involving guns) which statistically makes New Zealand the safest country in the world to live in for the size of its population. That guilt was replaced by a perverse sense of relief when it was revealed this was not a New Zealander who perpetrated this crime but an Australian who had been welcomed to our country as an immigrant himself. That relief was replaced by a degree of anger that this Australian would bring his hate to our peaceful land. That anger was supplemented by utter disgust when within hours at least one Australian Senator came out and blamed my country’s immigration policies and allowing Muslim ‘fanatics’ into the country for the massacre. The simple and sad truth is the ‘fanatic’ was not a Muslim. The fanatic was not a product of New Zealand and was not a New Zealander. The fanatic was sadly, a product of Australia. A man with values that no New Zealander would share. Australia needs to own this monster (and preferably once he is convicted of 50 counts of murder, deported home so they can wear the cost of his incarceration). If I was an Australian I’d be seriously concerned about the rise of the far right in their country and the politics of xenophobia that is leading to more Australians thinking like this guy does. There is no doubt that the overwhelming majority of Australians stand with their New Zealand cousins and are as shocked as we are that one of their own could perpetrate anything like this. I would suggest however that as a country, they need to take a long hard look at themselves, and the people they have elected to represent them. Only last week in my blog I referenced the fact that immigration is the ‘hot button’ issue in this years’ election in Australia. Naturally, as expected of them, the political leaders of the major Australian parties all came out and condemned the attack but the major political parties are all, to a greater or lesser extent anti-Islam and/or milking the anti-immigrant vote themselves and all have used the fear of foreigners in all recent election campaigns (refugees = Muslims = fanatics = terrorists or ‘migrants steal jobs off Australians’). Our dead weren’t fanatics. Nor were they beneficiaries of Australian immigration policy. 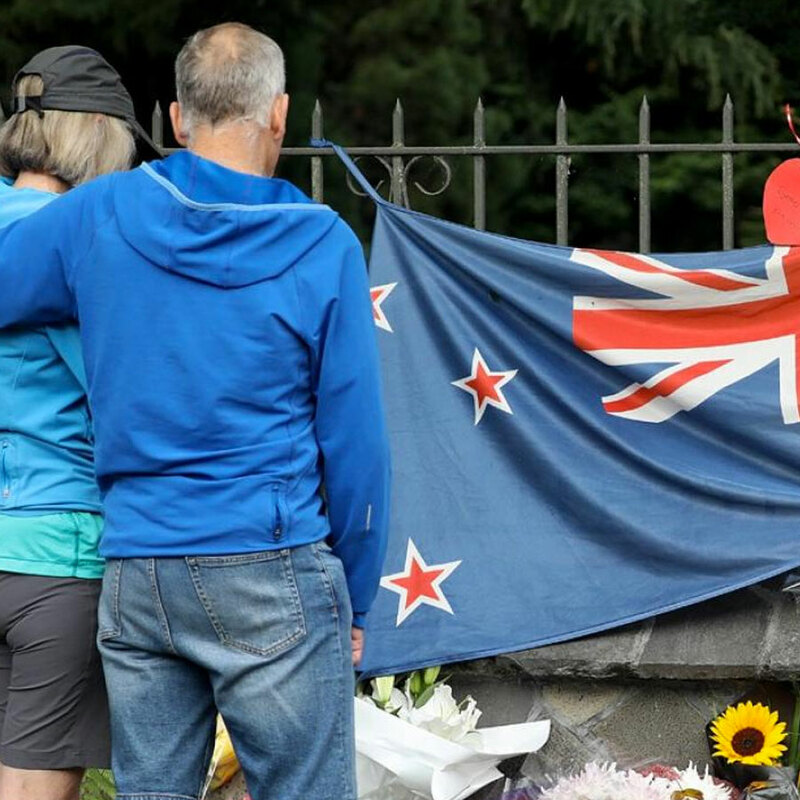 The dead were innocent New Zealanders - grandparents and children, husbands and wives — our neighbours, schoolmates, fellow cricket enthusiasts, All Black supporters and our friends. At prayer. Living peaceful lives in a peaceful country. Building, not destroying. If they weren’t born in New Zealand, as many were (and that makes them Kiwis first, ‘Muslims’ second), they came here to build or secure better, safer lives. I have wondered for some years how long it would be before an Australian born Muslim might carry out a serious attack on the country of their birth because of the increasing messages of hate that a minority, but vocal, number of politicians subscribe to. There has been some very close calls. Each and every Aussie needs to ask themselves ‘How did we create this monster?’ For create him Australian society did. Aoteoroa New Zealand and our people just paid a very heavy price for Australian politics. I don't think all of our own politicians should however get off lightly either, but at the same time our ‘immigration politics’ is on a completely different and far less venal scale to what seems acceptable in Australia. Our current Deputy Prime Minister who is also our Foreign Minister, and leader of the rather nationalistic sounding "New Zealand First" party, strikes me as hypocritical, given since 1996 he has only got into parliament on the back of his three yearly (then silence) anti-immigration rhetoric. He has expressed disappointment this week that the President of Turkey used some of the live screen footage of the massacre for political ends in his country. While certainly distasteful on the part of the President of Turkey, surely a case of the pot calling the kettle black when you use the fear of 'foreigners' to further your own political ambitions? We have three parties making up the current government, all of which to a greater or lesser extent, campaigned on lowering immigration levels two years ago. They all lied. None, apart perhaps from the New Zealand First Party, really meant it. That didn’t stop the Labour Party blaming people with "Chinese sounding names" for pushing up Auckland house prices. Words have implications, political posturing has consequences, and they aren't always pretty. It is all very well New Zealand politicians roundly condemning this Australian for his actions, but I do hope they will remember in our next election cycle what they have all said this past week. Even if it means, in the case of New Zealand First, other political parties have the courage to forgo power if the alternative is partnering with a party that gets elected on the back of race based politics. At the same time I fervently hope Australians find the strength, come their elections in May, to send a clear message to the nation’s politicians through the ballot box - sowing division and hate is beneath you. Politicians from One Nation and others like Fraser Anning were voted in - there is a constituency in Australia for the hate and ignorance of the murderer. While New Zealand just paid an horrendous price for Australian politics, I fear it could be their people next in line, for such an attack. I desperately hope it doesn't happen because no family, community, city or country deserves anything like what was perpetrated last week in our peaceful land and on our peace loving people. What New Zealanders have clearly demonstrated over the past week however is that we are close knit and genuinely just a ‘big village’ of over 200 ethnicities. We will not be weaker for what has happened, but stronger. Perhaps, I hope, also a little less naive. I have been so heartened this week that none of our Muslim clients have withdrawn from the process of migrating to this beautiful country and all are still coming to join us in New Zealand. I hope anyone that might feel that Muslims (or migrants) are not welcome in New Zealand or that New Zealand is now too dangerous should read many of the interviews with survivors - none are quitting the country, they still love it for it for what it truly is. We have in part our Prime Minister to thank for that. She is us, as we are her. My final thought is a nomination for Australian of the Year. Will Connolly is the 17 year old who with a simple act of moral defiance sent a very clear message to a very arrogant and racist Australian politician, in Fraser Anning, on Saturday. This is the lad that showed the world that most Australians are nothing like the monster who came to our shores. The simple act of cracking a raw egg on the head of the Senator from Queensland who announced this massacre was the fault of Islam and my country’s immigration policies made him look like the ignorant, vulnerable fool he is. Good on ya Will. An Aussie like you is always welcome in New Zealand. In fact, with that simple yet powerful act, you could almost be a Kiwi.